Junk removal seems like a dirty business, but Aaron Fastman is trying to make it both cleaner and greener. Last December, the 32-year-old Winooski resident opened a 1-800-Got-Junk franchise in Williston. The Vancouver, British Columbia-based chain bills itself as the world's largest junk removal service. Fastman and his two full-time employees aren't garbage men; they don't show up once a week to take away your trash. Instead, they specialize in helping people get rid of the items that the average American consumer accumulates over the years: old appliances, furniture, computers and construction debris. "Things the garbage man just isn't going to take," Fastman explains, "and if he does, he's going to charge you an arm and a leg for it, and you're going to have to bring it to the curb yourself." Nancy Plunkett, waste reduction manager at the Chittenden Solid Waste District, says there's definitely a need for such services, especially in what she calls our "consumption culture." "We have a real issue with over-consumption," she says, adding that last year Chittenden County residents landfilled nearly 144,000 tons of household, business and construction waste. "That's a lot of trash," she says. Other businesses and small-time contractors offer similar services in Vermont, but Fastman claims his crew is doing something different. For one, the 1-800-Got-Junk call center answers every customer call within 20 seconds. "We're professionals," he says. "We guarantee to show up on time, we're always in uniform, we always call people ahead of time to confirm their appointment, we clean up after ourselves." It's true. Fastman, his operations manager Jonathan Diamond and employee David Hyman are all decked out in official 1-800-Got-Junk gear when they show up at a house on Weaver Street in Winooski one recent Monday morning at 10. They follow the homeowner to the shed and scope out some sheetrock and bamboo rods, a few black plastic bags of trash and a rusty old wood-burning stove. "Isn't this brilliant," the customer says as they scoop it all up and plop it in the truck. Fastman and his workers sort through every load and recycle whenever possible. He describes himself as an environmentalist, and estimates that 60 percent of everything his business has collected gets recycled, through outlets such as the Salvation Army, ReCycle North and Queen City Steel. "My goal," he says, "is to keep stuff out of the landfill." The 1-800-Got-Junk office at the intersection of Williston Road and Industrial Avenue reflects that mission. Nearly all of its contents - including a desk, a bookcase and a sofa - came from customers. Even the office's flat-screen computer monitor was "pre-owned." "We cleaned out the Homeland Security office in St. Albans," Fastman recalls, "and we got 10 of these flat-screen monitors." When Fastman can't use something in his own office, he passes it along to a friend. He's trying to make connections with local governmental agencies and nonprofits; he'd like to give furniture and appliances to families in need. "We're really trying to become a player in the community, and help people out," Fastman says. Often, customers hire the company to get rid of perfectly usable things, such as a Tiffany chandelier or 10 Italian wool suits in garment bags. "They throw away stuff that, it's more that they don't want it, not that it's junk," he offers. Does Fastman ever sell the stuff on eBay? Not yet, he says, though he notes that he and his employees occasionally make a few dollars reselling scrap metal. Fastman grew up in Woodstock, New York. After college he worked at Burton Snowboards, but quickly became dissatisfied with his work inspecting broken Burton products. "It wasn't fulfilling," he says. He stayed at the company, but also took a job as a social worker in Burlington, to save money for his house. When his wife got pregnant over a year ago, he decided it was time for a change, he says. "I just needed to take a little bit more control of my financial future." His father suggested he check out 1-800-Got-Junk; a family friend had purchased a franchise in Maryland. Fastman initially dismissed the idea. "It was one of those things where, when I first saw it, I laughed at it," he says. But he changed his mind after doing some research. Turns out, the junk business is booming. 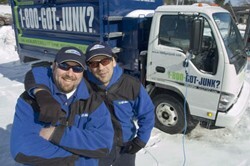 Brian Scudmore founded 1-800-Got-Junk in 1989, but it's really taken off since 1997. There are now more than 200 franchises in the U.S. and Canada. Why the rapid growth? "We're such a nation of consumers," Fastman theorizes. "We've come to a point where we've consumed so much, now we're looking around and we're saying, 'We have too much.' And I think that no one has really tapped into that market, and given people a solution to that problem." The 1-800-Got-Junk solution isn't cheap - rates are based on how much space your stuff takes up in one of the bright blue company trucks. A full load costs $598; the minimum charge is $99. Fastman points out that the price covers sorting, lifting and loading, as well as taxes and most dumping fees. It's more expensive than getting rid of stuff yourself, but customers like Joy Hopkins of Burlington say the service is worth it. Hopkins, a habitual packrat, realized recently that her extra clothes and couches and broken bicycles were taking over her house. "I can't even use my closets, there is so much clutter," she confesses. "I've just boxed myself in with my stuff." Fastman and his crew have already removed a full truckload from Hopkins' home, and she plans to bring them back again soon. "They're not done with me yet," she says somewhat sheepishly. Hopkins was relieved that the junk guys weren't judgmental about all the stuff she'd amassed. "They're clinical in a very kind way," she says. "Like a nice dentist who doesn't say, 'How did this happen?'" Arthur Rideout of South Burlington had a similarly positive experience. He called 1-800-Got-Junk to remove some large pipes and pieces of wood. "They were very good," he says. "They came on time, they were very quick, they were very thorough. They did what they said they were going to do, and did a bit more." With testimonials like that, you'd think they'd be busy, but so far February has been slow. Fastman's not worried, though. This is a seasonal business, he says. "We're bracing ourselves for spring."